It has been raining a lot here in Tokyo. Like a lot a lot. Five days straight and doesn’t seem like an end is in sight. In fact the dread Super Typhoon Lan will hit tomorrow. I am not sure that this is normal, but it feels an awful lot like London or Vancouver. Clothes always a bit damp, old knees a bit cranky and a restlessness after being stuck inside watching rainwater mist the windows. So, in an effort to avoid stir-craziness we wrapped our daughter in rain-boots, forced our son to put on socks, grabbed the umbrellas and headed off to find some place super close to eat. Our local shotengei (market street) is called Kitamachi and happily it is a bit decrepit and weathered with many older businesses still surviving and offering a wonderland of yummy food things: sushi, fried chicken, amazing butchers, ramen, yakitori, vegetable shops, odongoya, cafes, yakinku and tiny alleyways clogged with izakaya — I have barely touched the surface. So Kitamachi we went! 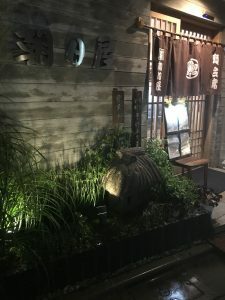 We pondered an okonomiyaki (savory pancake) spot that was issuing out some tantalizing smells, but settled on Asahiya, a soba restaurant that has occupied the same space for about fifty years. It was empty. Very empty. We were seated next to a fish tank with a very large, very dour looking catfish who refused to be hospitable and fixed us with one off-putting eye. The owner, in her mid-70s, betrayed none of the anxieties of a restaurant owner with no customers – she was warm in her welcome bringing hot towels and cold barley tea. We started with Go Ebi Karage, fried tiny whole shrimp seasoned with lemon. Visually, this dish brings home the reality that shrimp are just bugs, but it was so delicious we could have had order after order and crunched away on the salty sweetness all night long. My son and I ordered hot noodles (both udon and soba) with tempura and my wife got the Udon hot pot. Tempura is a tough one – a true culinary tightrope. It was introduced to Japan by Portuguese traders in the 16th century in the form of (I guess) Fritto Misto. Great tempura needs to be both light and crunchy yet not obscure the freshness and flavor of the individual ingredients. The tempura we were served was just about perfect – light-as-air, grease-free shrimp, okra, yam, oyster mushrooms, shishito peppers, white fish and shiso leaf. 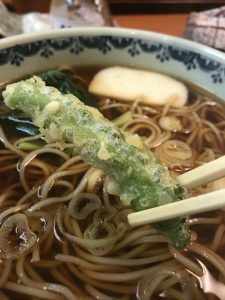 Dunked into the hot soba broth, the tempura retained its crunch while absorbing the smoky notes of the soup. The noodles themselves? Not so great. A little over-cooked and just not the greatest quality. Given the goodness of the tempura we tried to order some fried oysters listed as a special. We wanted just the fried oysters not the dinner set with soba and pickles. We were met with a very specific kind of Japanese inflexibility. The answer was just…no. It was impossible to do — no matter that the whole restaurant was empty, no matter that we would have paid whatever she would have charged. You want this oyster? You have to eat some soba with it. I have run up against the intransigence a few times in Japan – where something is just the way it is and there is nothing to be done to change it. I find it baffling. I once went to a shop in a train station that sold lots of cute stationary stuff and I bought a bunch of little things. As the cashier rang me up, she began to wrap and bag each item individually — time was ticking and my train was coming. I tried, I begged to get her to stop and just put everything together. I couldn’t do it — this was the way things were going to go and she just could not stop doing it. I missed my train, but had some really well packaged pens. Well, in the same spirit, we gave up on the oysters and ordered an “appetizer” order of the awesome tempura instead. And loved it. Total for 4 giant bowls of noodles, pickles, rice, tempura (and extra tempura), baby shrimps and sake: $55. Still raining, we took our leave giving a spirited “Konbanwa” to an older man slowly making his way down the street, two canes helping his balance. Heiwadai has a lot of old people, Japan has a lot of old people and for the most part they seem pretty happy to be noticed and hailed up. We decided that we were not ready to return home, so maybe desert? I had stopped earlier in the week at an old-fashioned Japanese cafe, so that is where we headed. Cafes in Japan are hotbeds of both eccentricity and calm. The old-fashioned ones serve coffee, hot drinks and a type of cuisine that seems to be based in some sort of bizarro-hallucinatory take on what someone imagined would be served in a midwestern small town circa 1952: pancakes, the dreaded “Spaghetti Neopolitan” (over-cooked pasta, ketchup, red peppers, hot dogs and Kraft Parmesan cheese), consomme, dainty sandwiches, Omu-Rice (a omlette containing rice and drenched in ketchup), Gratins, curry rice and extravagant ice cream parfait and cakes. They are often the singular vision of their owners and beholden to their obsessions; thus, you find cafes decked out in hundreds of photos and miniatures of 1960s Vespas or devoted to a singular Japanese actor who starred in Samurai films of the 1970s or maybe a certain brand of stuffed animals or Telly Savalas…the list of obsessions is long and, in Japan, perhaps even longer than anywhere else, so never be surprised by what is represented in a cafe. More often than not — to my surprise — the owners play records from their collections. I’ve heard lovely classical quartets and free jazz and once, in a cafe in Yokohama, a well-worn copy of Strawberry Alarm Clock. The cafe is a haven. Customers linger, they talk quietly, they smoke a lot, they read. Needless to say, I love these places, I love abandoning my own aesthetics at the doorway and surrendering to the fantasy or obsessions of the proprietor. It allows me to happily eat a rice stuffed omelette while enjoying classical music and pondering the genius of Telly Salavas. The cafe we went to was frozen in 1972. Color scheme orange and beige with a touch of “Pretty Baby” ornate glam. Lots of fake flowers, odd figurines, flashy chandeliers…change a few details, add a touch of new paint and it could have been a hipster club in Brooklyn with four white kids playing En Vogue. 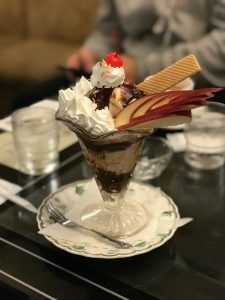 Blazing hot, individually brewed coffee, ice cream parfaits of staggering dimensions with carved fruits, wafer-cookies, sprinkles, loads of whipped cream, chocolate sauce and the nuclear option Marachino cherry. John Coltrane’s version of “My Favorite Things” bubbled in the background. A physics student smoked another cigarette. An old man cleared his throat as he turned another page in his Kenzoburo Oe novel. I hope this is true. I hope these old places with their weird Consommes manage to survive with an influx of young weirdos who can see the charm. I hope the old ladies who won’t give me a fried oyster manage to keep shuffling out of their kitchens with graciousness, their stubbornness and their fresh fish. To me, this is incredible value — I spent $75, fed my family in a bunch of different ways and had a great time. 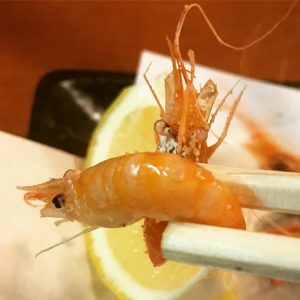 Yes, in New York, I could manage to eek out a good meal and desert for under $75, but not soba and tempura and crazy little baby shrimps! I’m still in thrall to all of this, so even old-lady soba is going to be pretty great to me. Forgive me. Or be jealous. Take your pick. I’ll be by the 8′ x 8′ portrait of Kojack, nursing a coffee and joyfully disappearing into myself. Fressing and fun on a rainy day. Reminds me of Vancouver during rain season (most of the year). Your mother and I would settle down in Congee Noodle House and eat congee enriched with scallops and mushrooms, fried squid with chiles, dim sum wraps of pork and chicken. Read NY Times, Globe and Mail, Vancouver Sun, etc. Drank countless cups of hot tea. Banished the moisture blues.